At least six people in one week have needed hospital treatment in Brighton and Hove after taking the drug Xanax recreationally, the city council said. The drug, also known by the name Alprazolam, can be obtained on private prescription in the UK. For some teenagers and young adults in the UK it has become a popular recreational drug and used illegally. Public Health England said users who buy the drugs online were "dicing with death". 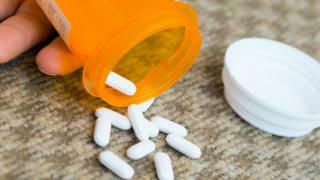 Alprazolam is similar to Diazepam (Valium) but is about 20 times stronger, Brighton and Hove City Council said. Dr Peter Wilkinson, public health consultant for the council, said: "There is increasing concern about the use of Xanax. It can have a wide range of harmful effects and overdoses can be fatal particularly when taken with alcohol and other drugs." The council said "at least six young people" had required hospital treatment between 24 February and 2 March. In November 2017, the rapper Lil Peep was found dead after an overdose of Xanax mixed with Fentanyl - a powerful synthetic painkiller. Rosanna O'Connor, Public Health England's head of alcohol, drugs and tobacco, said: "It is a real and immediate concern among the young people who it seems to be a drug of choice for. "They are dicing with death really because these things are dangerous." In February, BBC South East found Xanax was being sold illegally to children on social media sites. Drugs charity Addaction said children as young as 13 had bought it online.